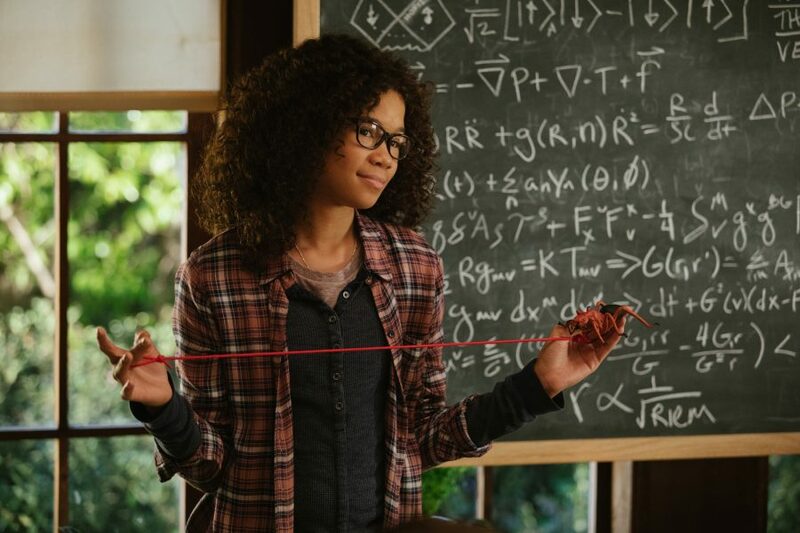 Storm Reid is Meg Murry in “A Wrinkle in Time”. Director Ava DuVernay has had a remarkable career. Outside forays in music videos and television, her films have been consistently powerful: The fierce family drama Middle of Nowhere, the revelatory doc 13th and the heart-wrenching Selma, they all have left an indelible impression. It wasn’t a surprise Disney would pick her to head the adaptation of the emblematic sci-fi novel A Wrinkle in Time. She has the chops and the sensibility to pull it off. Which is why it pains me to say A Wrinkle in Time is not up to par. It’s not necessarily DuVernay’s fault. The script is agonizingly obvious (kids are more sophisticated viewers than the movie gives them credit for) and commits a capital offense for an adaptation of this nature: It nearly forgoes world-building. Also, as seminal as the Madeleine L’Engle book is, it’s 56 years old, and every plot point has been recycled to death. The one thing A Wrinkle in Time has going for is zeitgeist: All major social movements crystalize in the story of Meg (Storm Reid), a brilliant 13 year-old who -following her father’s disappearance- has turn sullen and withdrawn. Well on her way to hopelessness, Meg and her family are visited by Mrs. Whatsit (Reese Witherspoon), a kooky figure who seems to know more than she should about Meg’s dad and his interdimensional travel theories. Soon Meg, her would-be boyfriend and her annoying little brother head to other worlds in search for the missing father, under the tutelage of Mrs. Whatsit, Mrs. Who (Mindy Kaling) and Oprah, supernatural, benevolent beings battling the Darkness, the source of all evil. I could go into further details, but there is no end to all the narrative details the movie both tackles and glosses over. While nobody expects a page-to-page recreation, A Wrinkle in Time does a poor job explaining the mechanics of the story. Things happen. It’s magic. Moving on. A poor casting decision (Meg’s younger sibling is hard to understand and much of the plot hinges on him) further hinders the film’s unfolding. Ava DuVernay manages however to keep the visuals interesting, particularly when choosing practical effects over CGI. For brief moments, the film becomes tactile, relatable. Makes you wonder what could it have been… with a better script. 2/5 planets. A Wrinkle in Time is playing everywhere.